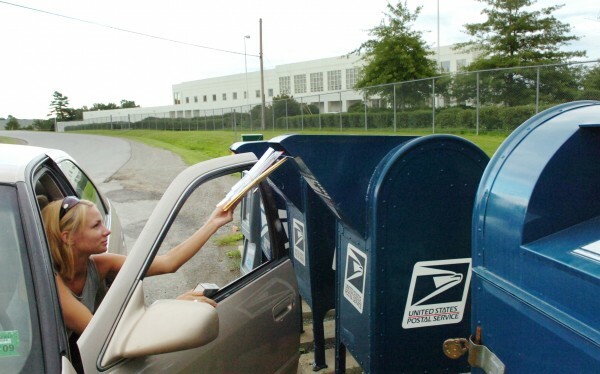 Hampden resident Crissy Rowe mails letters outside the U.S. Postal Service Eastern Maine Processing and Distribution Facility in Hampden in 2008. HAMPDEN, Maine — U.S. Sen. Susan Collins’ bipartisan postal reform bill is expected to go to a vote Wednesday, but time is short with the announced consolidation of the Hampden postal plant just three weeks away. Amendments to Collins’ postal reform bill — which would keep the Hampden mail processing facility open — were handled in rapid succession Tuesday afternoon. An expected amendment by Republican Sen. John McCain, which would have almost completely gutted Collins’ bill and made it nearly identical to one sponsored by Rep. Darrell Issa, R-Calif., in the U.S. House of Representatives, was not introduced. But he did offer an amendment to set up a commission to further study the USPS proposed plant consolidations much like the military base closure commissions formed in the past. That amendment failed, according to a Collins spokeswoman. The Senate on Tuesday accepted an amendment by Sen. Olympia Snowe, R-Maine, that would place the Postal Regulatory Commission in charge of independently verifying USPS methodology and estimated cost savings from plant consolidations. Snowe said Tuesday the necessity of her amendment was highlighted earlier this year when the USPS claimed an “annual management savings” of $797,000 from the elimination of two management positions but later revised that figure downward to $177,000 after she questioned the figure. An amendment to limit government conference spending passed, as did one to encourage the USPS to locate post offices in government buildings, the Collins spokeswoman said. Another amendment passed that would prohibit the USPS from closing postal facilities in vote-by-mail states before Election Day this year. Ed Gilman, spokesman for Democratic 2nd District U.S. Rep. Mike Michaud, said that after this week, the House will next be in session the second and third week of May. While there are no plans to take up any postal bills this week, Michaud’s office was told that House leaders hope they can come together soon to find common ground between a House bill and the Senate bill now under consideration. No timeline has been given, though. A key provision of Collins’ bill would require overnight delivery standards in some cases, and overnight delivery in Maine would be impossible without both the Hampden and Scarborough plants in operation. USPS officials announced last February that the processing operation at the Eastern Maine Processing and Distribution Facility in Hampden would be consolidated, resulting in the loss of 170 of 183 jobs. Employees were told more than a month ago that the plant’s processing services would be shifted to the Southern Maine Processing and Distribution Center in Scarborough starting May 19. Postmaster General Patrick Donahoe agreed in a letter to Collins and other senators Tuesday that the language in Collins bill would keep the Hampden facility open. About 100 other postal facilities slated for closure nationwide likely would stay open if the bill becomes law. “I anticipate the Senate will pass the bill on Wednesday,” Collins, R-Maine, said Monday night. Closing the Hampden facility makes no sense, Collins and Snowe said, because mail from Caribou to Madawaska would have to be sent first to Scarborough, only to return to Aroostook County, a round trip of more than 600 miles. Both Maine senators also said the slower delivery time would force businesses and other postal customers to look for other delivery options. Correction: An earlier version of this story quoted Tom Rizzo as saying “Unless something changes, the self-imposed moratorium and changes will occur by May 15.” Rizzo said the changes will occur after May 15. The original statement was made in the hours before the official Postal Service statement on facilities that might remain open and the Postal Service regrets the error.